Aside from some of Propellerhead's own devices, there are some really great Rack Extensions out there for stutter-edit and glitch effects. Here we see Slice Arranger, Glitch and Buffre. Ground-breaking productions like BT's 'Somnambulist' and Squarepusher's 'My Red Hot Car' — both stunning in their technical mastery — have really popularised so-called stutter-edit and glitch techniques. Indeed, they're cropping up regularly in mainstream pop production: check out 'Starry Eyed' by Ellie Goulding to see what I mean. Over the last year, I've written about the way several Reason devices can perform these kinds of isolated loops, freezes and blips. In the October 2012 column, it was Polar, and its Lock feature. In April 2012, it was The Echo's Trig button and Roll mode, and a little further back, in February, Alligator's rhythmic chops. The techniques explained in those columns are all great, and well worth practising, but recently several third-party developers have stepped up with even more specialised Rack Extensions. This month, we'll have a look at some of these and see exactly what they can do. This was one of the very first crop of Rack Extensions. I haven't heard it referred to much in the Propellersphere, and maybe that's because it can initially look rather uninviting and limited in scope. Persevere, though: it's worth it. 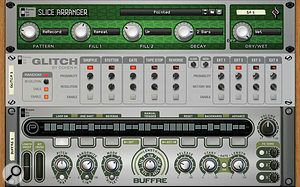 Slice Arranger is a preset-based effect offering 50 ready-rolled glitch and 'micro-loop' patterns, selected with the pattern knob. There's tremendous variation within them, though: each pattern triggers various techniques, like simple repeats and upward or downward pitch shifting, and you decide which with the Fill 1 and Fill 2 pop-up menus. Their accompanying knobs control the strength of the effect. Set the decay knob low and you get rhythmic gating thrown in for good measure. With the Decay section's pop-up menu, you choose between running the pattern over one or two bars; effectively full- or half-speed. The least intuitive bit of the device is the first pop-up menu, with its two choices of Normal and ReRecord. In Normal mode, whatever audio flows into Slice Arranger first gets 'stuck', and keeps repeating, to the exclusion of more recent audio. Switch to ReRecord and the thing works in real time, which is possibly more like what you'd expect. Of course, like any pattern-based device, the effect gets predictable and 'old' pretty fast if you just leave it on the whole time. The trick is to find an interesting pattern, tweak it, and then drop it into your song momentarily, by automating Slice Arranger's Bypass/On switch, or its Dry/Wet mix knob. Reason's offline rendering of individual tracks is the precursor for performing old-school manual stutter edits with the razor tool. This superbly affordable Rack Extension takes another approach to glitch treatment: you choose when to trigger separate Shuffle, Stutter, Gate, Tape Stop and Reverse effects, by 'playing' them via MIDI or automating them. Each can also be subject to random behaviour too, though. Let's say you want to occasionally play a beat of a Dr OctoRex loop backwards. After creating an instance of Glitch for your OctoRex, go to its Reverse section and turn its resolution knob fully left to show a resolution of 1/4 (a single quarter note beat). Then right-click an empty part of the panel and choose Create Track for Glitch. Select the track in the sequencer (if necessary) to route your MIDI controller to Glitch. Now, as you play your song, play MIDI note G3 for one beat — Reverse is activated as long as you hold it. The other sections, all of which have their own rhythmic resolutions, are triggered (from left to right) with the nearby MIDI notes C3, D3, E3 and F3. Many can be triggered at once, so feel free to play 'chords' with those notes and create complex effects. For more chaotic, nicely unpredictable results click Enable and Dials in the Random section. Now when you trigger an effect you take pot luck as to its resolution, which is quite exciting! This random effect can also be started via MIDI: turn off Enable manually, and then use MIDI note B2 to trigger it momentarily. By the way, if any of the Probability dials are turned up when the Random section is enabled, Glitch will trigger effects itself. This is less useful than you'd think, because it never triggers nothing: ie. if any one effect has anything other than zero percent probability, it'll be enabled constantly. Never mind, though! If Glitch only did what I've described so far, it would still be a huge bargain. Let's face it, most of us would pay €7.50$9 for the tape-stop effect alone. But in fact it goes further still, allowing you to patch other effect devices into its rear-panel send/return loops, and then trigger those as if they were on-board effects, via MIDI notes A3, B3, C4 and D4. Fantastic! Short, high-feedback delays, ultra long-decay reverbs, aggressive band-pass filters, bit-reduction effects... the list of suitable 'ear candy' effects goes on. And it's a whole lot easier than automating those effects independently. 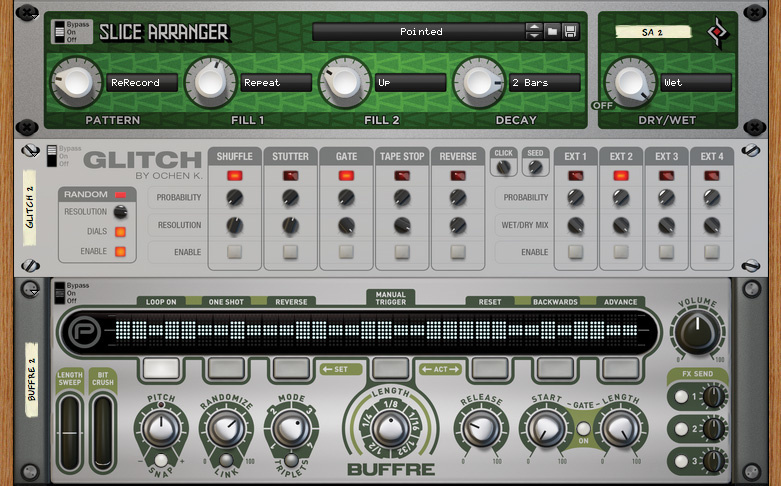 Another pioneering Rack Extension, Buffre clearly regards itself as an effect you 'play', because when it's created directly in the rack it makes a sequencer track for itself. You still need to make one manually, though, if you create Buffre as an 'insert' effect in a Mix Channel or Audio Track device. To get going with it, try this. Create an instance for one of Reason's pattern-based devices, select the Buffre track in the sequencer, and start playback of your song. Play some MIDI notes in the range D1 to F3 and listen to what happens. The notes trigger loops varying in length from a 1/2 note (D1) to an absolutely miniscule 1/1024 note, and while the loop plays, the incoming audio is muted. You can see it happening on the display: the scrolling bars are a coarse representation of the audio waveform, and during looping a little cursor shows which bit of the audio is being played. Try turning your MIDI controller's pitch-bend and modulation wheels; these tally up with Buffre's front-panel wheels. Pitch-bend smoothly alters the loop length up and down for dynamic changes, and the mod wheel introduces 'bit crush' sample-rate reduction, which somehow really complements the stutter edit sound. For more weirdness, adjust the Pitch knob, or do it momentarily (over a narrower two octave range) with MIDI using keys C-1 to C1. Buffre can do its own version of a tape-stop effect with this, too: trigger a 1/2 note loop, and, while it plays, drag down (or automate) the pitch knob. The last thing to cover in this quick intro to Buffre is the Mode knob. Mode 3 (Current) is considered the normal setting, looping audio that is incoming the next time it reaches a suitable point rhythmically. Mode 1 (Past) on the other hand, immediately plays audio that has already passed. Modes 2 and 4 are variations on these, tacking on backwards playback (for 'ping pong' looping) — ideal for scratching effects. See which one suits your needs the best. If you want your share of glitch but aren't inclined to spend any hard-earned dosh on Rack Extensions, you can always do it the old-fashioned way: in the sequencer. In Reason's File menu, choose 'Bounce Mixer Channels...'. In the dialogue box, tick the Kong track you want to work on. You also need to decide whether to capture the contribution of Reason's mixer or just have Kong in the raw — the radio buttons on the right explain all. 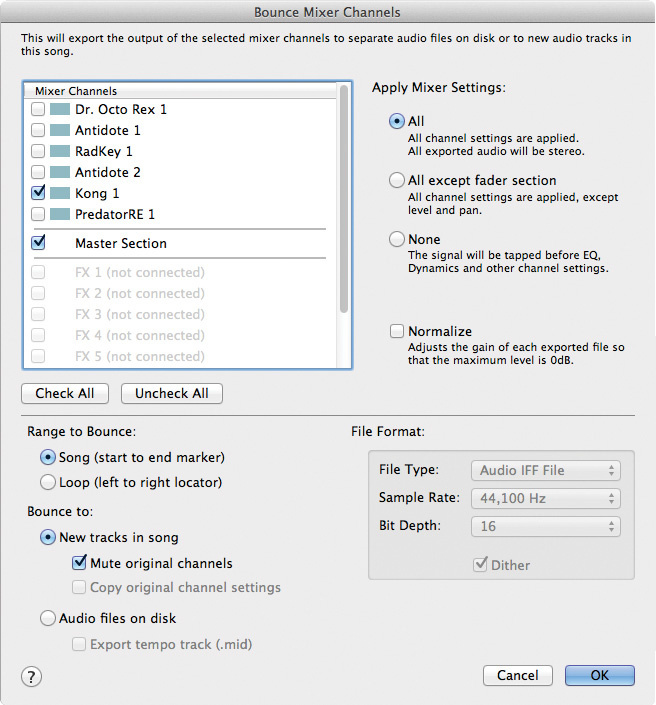 Lower down, choose 'Bounce to: New tracks in song', and 'Mute original channels', then click OK. When Reason has finished chugging away, find the new 'bounced' track in the sequencer. Choose an appropriate edit resolution, such as 1/16, and enable grid 'Snap'. Now comes the fun bit... if you're into painstaking work! 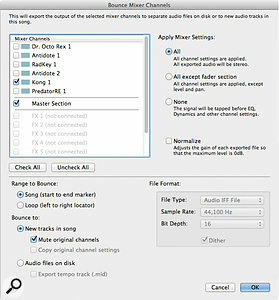 Select the Razor tool (R is the keyboard shortcut) and click in the audio clip around an individual drum hit or short section. Switch back to the Selection tool (with the Q key), and select the new clip. You've got choices now: maybe Alt-drag it a few times to adjacent 16th-note divisions to generate a repeat, or right-click it and choose Reverse Clips to play it backwards. Another idea is to work through a series of nearby 16th-note clips and apply a different Transpose value to each one. How about increasing the edit grid resolution and just dragging the right‑hand clip handle to truncate it and get a kind of gated effect? Working like this is not quick, but if you have the stomach for it, you can achieve some really individual effects that are completely under your control. In the November 2012 Reason workshop, I looked at the currently available reverb options in Reason 6, including third-party Rack Extension offerings, then another came along just after the magazine went to press. Unfiltered Audio's Renoun (€25) is an algorithmic design that clearly emulates certain Lexicon hardware units. Flexibility comes from an onboard modulation section that subtly — or drastically — changes the pitch of the reverb tail. For even more weirdness, every parameter (except for wet/dry mix) can be modulated from rear-panel CV connections. The effects of that can be seriously unpredictable! Overall, it's a fine-sounding 'go to' reverb for many tasks, but it'll also keep more experimental Reason users happy.